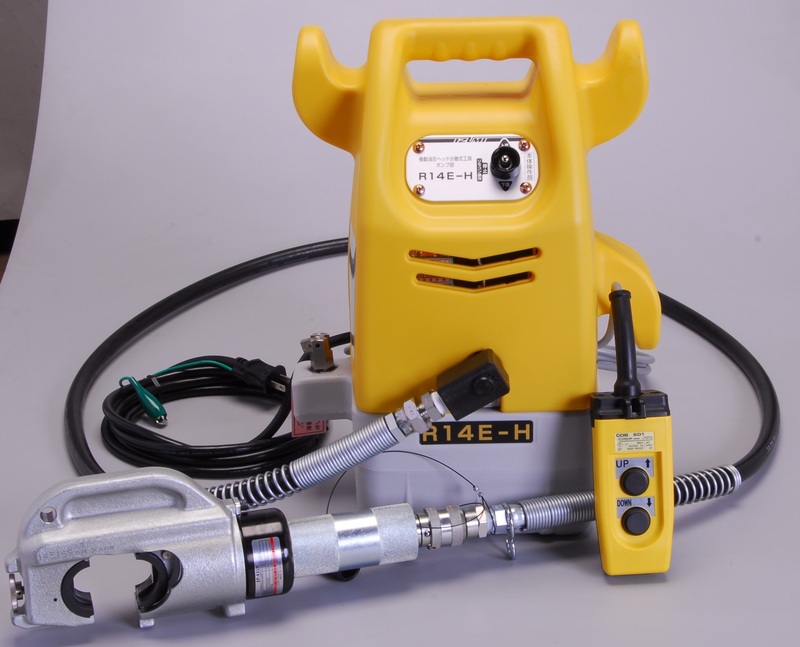 R14E-HL Hydraulic Pumps: Izumi Products. The R14E-F1 remote operated pump gives the operator complete control. Push buttons permit the operator to advance and retract at will. The operator is never comitted to a full cycle, and can always back off at anytime during the advance even under pressure. This feature increases the efficiency because cuts and crimps can be adjusted as necessary, simply by stopping the advance or retract mode. The electric motor shuts off when UP button is released and the pressure reaches to preset value of 700 bar. The ram can be retracted down while the button is depressed. A 3 metre remote control cable provides both safety and convenience. The operator can set up an operation and then move away from the work site before engaging the tool.